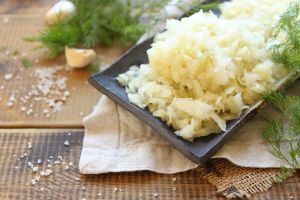 I usually find myself foraging through the fridge after my workout sessions, looking for quick meal ideas. Some day’s I’ll have loads of energy, but other day’s I simply don’t have the time nor the energy to start cooking from scratch. So, the hubby came up with the idea that I should start preparing protein patties that I could freeze, and easily defrost, bake and enjoy next to whatever he would be making on his cooking nights. That’s right, twice a week the hubby takes over the kitchen and cooks us up a delicious meal. 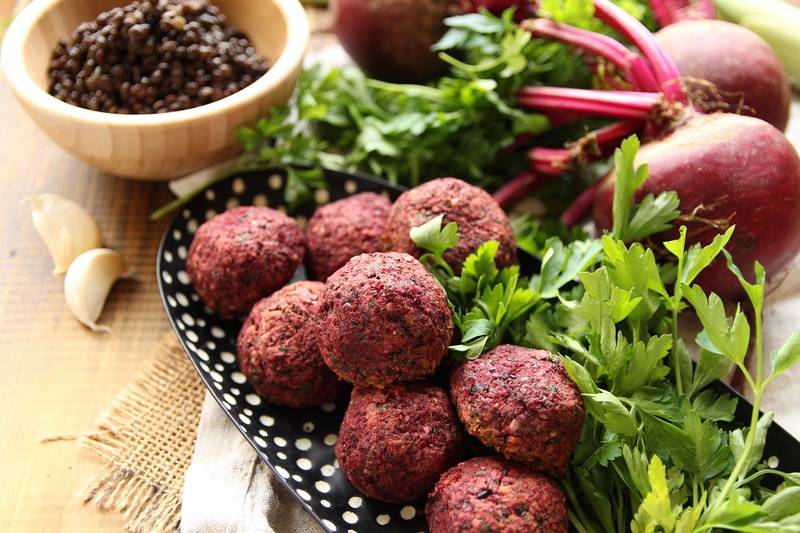 But back to the story, I immediately fell in love with the idea, started experimenting, and that’s how I was inspired to create these delicious vegan beetroot and black lentil balls. They’re the perfect solution for busy days, and weeks. Simply prepare a batch in the beginning of the week, then freeze and defrost them as needed. I decided to keep mine falafel sized, but you can easily shape them into burger sized patties, it’s up to you. Note, you might need to bake them a while longer. 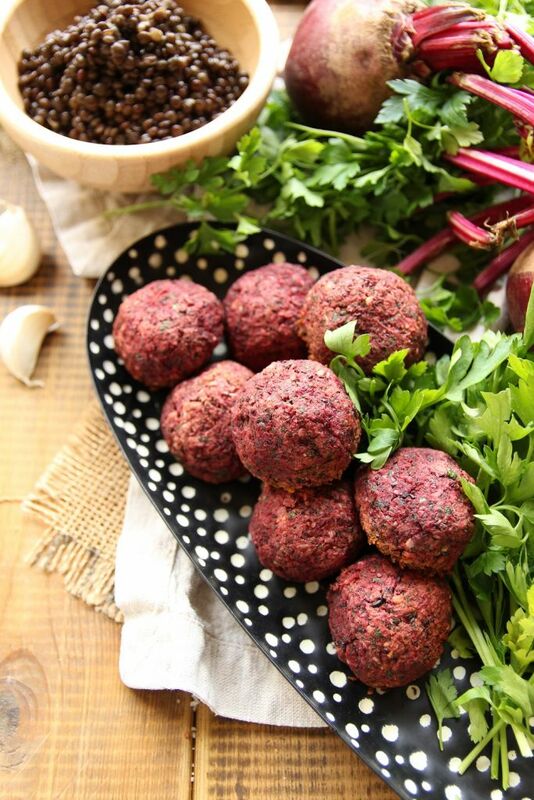 These beetroot balls are easy to prepare, high in protein, filled with nutritious ingredients such as chia seeds, nutritional yeast, fresh parsley, almonds, lentils, and beets and SO incredibly delicious! All you’ll need to get your hands on is a food processor. I usually whip up a batch of 10 protein balls, just because I don’t go through them that quickly, but you can multiply the recipe to suit your own weekly meals. You can also fry these beetroot balls, I personally wanted to bake them in order to use less oil. So, make them, freeze them, thaw them, bake them, and enjoy them! Cook the black lentils according to package instructions, drain and set aside. Finely dice the red onion and finely slice the leek. Heat a saucepan on medium heat, add the olive oil, then add the onion and leek. Crush the garlic clove, add to the pan and saute until they start to slightly brown. Remove from heat and set aside. Peel and grate the beetroot. Place the beetroot, cooked chickpeas, black lentils, almonds, nutritional yeast, chia seeds, fresh parsley, sea salt and black pepper, and sauteed onion, leek and garlic into a food processor. Blend until well combined. Take a small amount of the mixture between your fingers to see that it sticks together. Taste a bit of the batter to see if you need to add sea salt and pepper. Form 10 vegan beetroot and black lentil balls, and place on a baking tray lined with baking paper. Add a drizzle of olive oil on top of the beetroot balls and pop into the oven for 15 – 20 minutes. Remove tray from oven, and with a spatula, detach the balls from the baking paper. Serve with tahini, in a sandwich, with a salad, some quinoa, vegan fish fingers, it’s up to you. 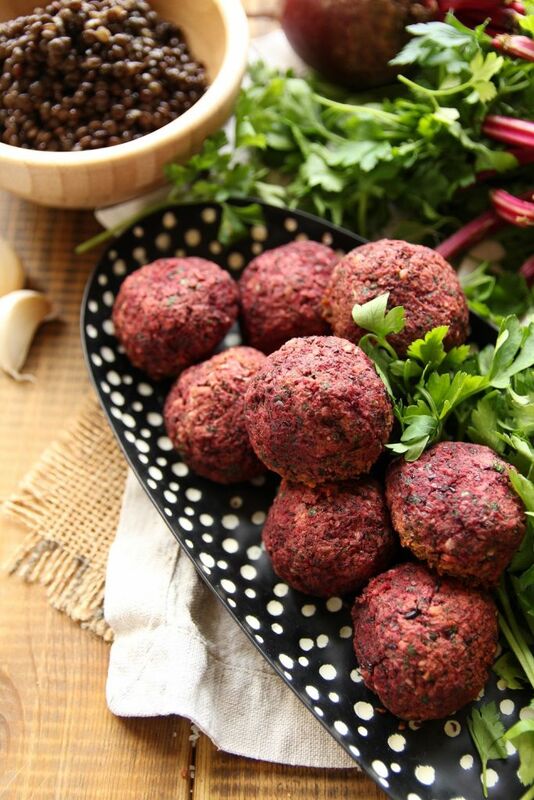 1 vegan beetroot and black lentil ball = 7 gr of Protein. 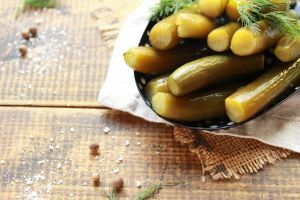 Next time try it in a sandwich with some sliced tomatoes, tahini drizzle, Homemade Sauerkraut and sliced Dill Pickles. ← Valentine’s Day Chocolate Dessert For Two – Vegan! Those lentil and beetroot balls look so yummy! Great idea for making healthy patties!